Honey bee loss explains the declining number of colonies within honey bee (Apis mellifera) populations. We are losing huge numbers of honey bees in the recent years. Here are the numbers worldwide. In the USA this phenomenon is called colony collapse disorder (CCD) . It has been reported mainly from USA, but in some cases also from Europe. 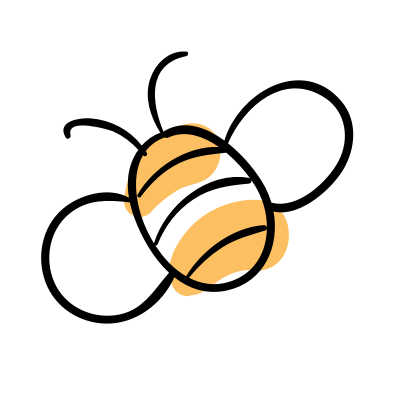 CCD affects managed honey bee colonies and consists of a rapid loss of adult worker bees. Since adult worker bees are responsible of the majority of the hive tasks, their absence causes the dead of the entire colony. In the USA during the period 2007-2014 a substantial percentage of winter colony losses (20,5-60%) died with symptoms compatible with CCD1https://www.researchgate.net/publication/282211157_Colony_Collapse_Disorder_CCD_A_Review_of_the_Possible_Factors_and_Agents_Involved. Other sources report losses of 30% to 90% in the USA2https://www.researchgate.net/publication/246044829_The_Effect_of_Cell_Phone_Radiations_on_the_Life_Cycle_of_Honeybees. In Europe, approximately 30% to 50% of honey bee colonies have been lost in the recent years, depending on the country3https://www.researchgate.net/publication/246044829_The_Effect_of_Cell_Phone_Radiations_on_the_Life_Cycle_of_Honeybees. Some countries seem to be less affected than others. It is difficult to make e one-fits-all statement for the whole European continent, since every single country has his own regulations and behaviours. This is demonstrated also on the following graphic. Figure 3: This graphic of the official EPILOBEE report of the European reference laboratory for honey bee health demonstrates the honey bee losses in European countries during the years 2012-2013 and 2013-2014. 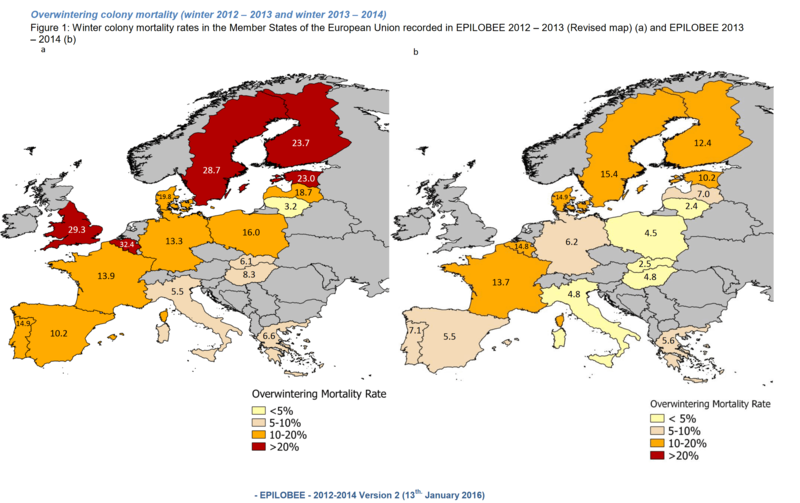 While in some countries the mortality rates improved significantly (Spain, Sweden, Finland, Germany) other countries rates worsened in this time span (France, Italy). Precise numbers seem to be known only for the U.S. and Europe, where honey bee losses have been thoroughly reported4OPERA Bee health working group: Bee health in Europe- Facts and figures http://www.pollinator.org/PDFs/OPERAReport.pdf. The only published data on colony losses in were reported in Brazil, Uruguay and Argentina, with reported and estimated losses of about 30-50 % every year5https://www.apidologie.org/articles/apido/full_html/2010/03/m09133/m09133.html. However, there are only few scientific resources about honey bee loss in South America. Four out of the five principal honeybee species live in India, reflecting a relatively healthy biodiversity. However, an estimated 75 % of honey produced in India comes from the wild Apis dorsata, the largest of the honeybee species. Yet India’s Apis dorsata numbers have dropped by 20 percent in just 10 years. Experts blame environmental pressures like deforestation and forest fires, as well as the importation of Western honey bees and their accompanying pests, which end up infecting wild hives6https://asiancorrespondent.com/2016/02/why-asia-should-worry-more-about-its-honeybees-than-its-tigers/#fYceYKbFfW7rczuY.97. In southwest China, excessive pesticide use has wiped out numerous wild bee populations that used to pollinate apple and pear orchards. Today these areas require labor-intensive pollination by hand, using paintbrushes, a practice only viable for more profitable crops7https://asiancorrespondent.com/2016/02/why-asia-should-worry-more-about-its-honeybees-than-its-tigers/#fYceYKbFfW7rczuY.97. Interviews with beekeepers and scientific papers from researchers around the world confirm that there is no singular cause being responsible for the death of bees, but an interaction of multiple causes. Still, habitat loss has been determined to be one of the major reasons for bee extinction9OPERA Bee health working group: Bee health in Europe- Facts and figures http://www.pollinator.org/PDFs/OPERAReport.pdf.Let’s discover the reasons for honey bee loss and find out why there is no “silver bullet” solution. Monocultures and flowerless landscapes induce habitat loss. The use of pesticides adds poisonous reside to crops and beehives, thus challenging the health of honey bees and pollinators. Varroa destructor and other mites and parasites weaken our bees and are a significant factor for colony loss. Some of the common practices for commercial beekeeping weaken the bee colonies and induce a lack of defense against diseases and parasites. Our world is increasingly connected through WiFi, consisting of electromagnetic radiation. Since bees navigate with the help of magnetic bars in their bodies, some researchers believe that radiation disturbs the bee’s sense of orientation. The newly arrived Asian hornet in Europe represents a serious threat to local pollinators, mainly honey bees. Our world‘s climate appears to be warming, causing shifts in weather patterns. These modifications in weather patterns can have an impact on honey bees and other pollinators at diverse levels.